Star Clippers is the inspired choice for a honeymoon, milestone birthday or anniversary, corporate gathering, or significant event. 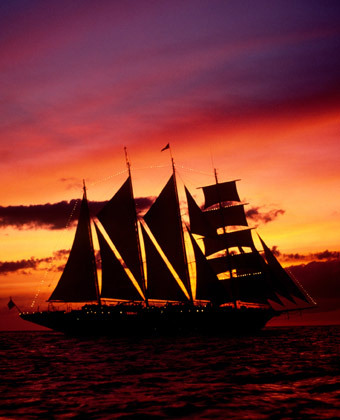 What could be more memorable than a magnificent tall ship sailing across a sunlit or moonlit sea? Honeymooners can relax in perfect privacy. There is a complimentary bottle of champagne and an assortment of fresh fruits and sweet treats, as well as a special gift and certificate signed by the Captain. This is available to all honeymooners who have proof of their marriage within 6 months of the sailing date. What could be more romantic than sailing to distant lands on an idyllic sailing cruise? Celebrations and corporate events are given the same attention by Star Clippers that you would expect at a top hotel or resort. The ship can provide great ideas and original touches to enhance your gathering. For the larger and exclusive event it is possible to charter a complete Star Clippers ship – the 170 passenger Star Clipper or Star Flyer, or the 227 passenger Royal Clipper. Contact us with your requirements for a Star Clippers Cruise for your special occasion, honeymoon, or corporate event.